After reading my post about suburbia a couple of times back, my colleague Penelope Poulou, who lives in Alexandria, Virginia, pointed out that even though Alexandria is considered part of suburban Washington, D.C., the city of 145,000 people is nothing like stereotypical modern suburbs. All, including Alexandria, I repeat, within the new federal district that no longer belonged to any state. 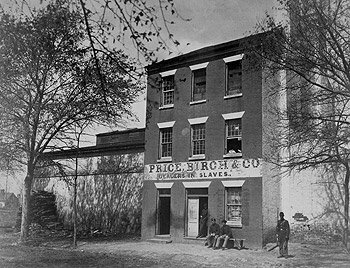 As a teeming center of the southern slave trade, Alexandria chafed under federal control, even though the commissioners who ran the young capital city paid it little mind. They were too busy trying to get the government functioning across the river. Eventually, in 1846, Congress washed its hands of Alexandria and Arlington and retroceded them to Virginia, only to see the state secede from the Union 17 years later to join a confederacy of disgruntled southern states. Federal troops hurriedly crossed the Potomac and occupied what had once been Washington’s own Virginia neighborhoods in order to keep the Confederate army at arms’ length — pun intended — from the capital. The point of this historical interlude is that Alexandria and many other old, close-in suburbs of America’s big cities have rich histories of their own that far predate suburban tract developments that, much later, would sprout from farm fields outside of town. And here’s something that caught my eye: CNNMoney.com, an online business magazine, recently published its annual list of the nation’s 100 “Best Places to Live” among America’s small cities. Alexandria finished 47th. That’s reasonably impressive, although one other Virginia city finished ahead of it in 30th place. It’s Centreville, in Fairfax County, west of Alexandria near the Manassas Civil War battlefield — called “Bull Run” by the Yankees of the North. Centreville’s a typical, well-to-do, unincorporated suburban boomtown of luxury townhomes, single-family developments, and enormous shopping malls. It’s 40 minutes away, all right — in the middle of the night. The grinding rush-hour commute into town on Northern Virginia’s clogged roads is far closer to the hour-and-a-half drive. Two other small Virginia cities — Chesapeake (85th) and Suffolk (91st), both in the “Tidewater” area near the Chesapeake Bay — made it into CNNMoney’s Top 100 list as well. 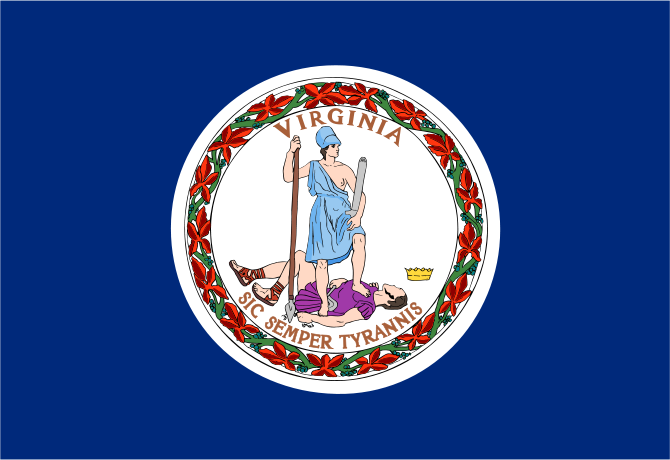 All of which gets me thinking about the “Old Dominion.” That term was given to Virginia by King Charles II of England in 1660 for the colony’s steadfast loyalty to the crown during the English Civil War. He even added Virginia’s coat of arms to his shield, joining those of his other dominions: England, Ireland, and Scotland. It was to that place, in the same song, written 13 years after southern slaves had been freed, that an “old darkey” sang that his “heart am long’d to go.” Even though Bland, its songwriter, was an African-American minstrel, his fond recollections of laboring “so hard for Old Massa” didn’t sound so peachy more than a century later. In 1997, the Virginia General Assembly declared that “Carry Me Back to Old Virginny” would henceforth be the commonwealth’s state song emeritus. 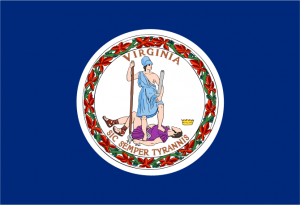 The Latin motto meaning “Thus Always to Tyrants!” — the same words spoken by John Wilkes Booth after he fatally shot President Abraham Lincoln — appears on the Virginia flag, in which the goddess Virtus (Virtue) subdues a Tyrant. If you’re curious about the term ”commonwealth, Virginia is one of four U.S. states that call themselves by that name. Kentucky, Massachusetts, and Pennsylvania are the others. The word has no particular legal meaning. I suspect that leaders in these places thought it would give their states a bit of snob appeal. Nowadays, Virginia is for Lovers, or so the commonwealth’s slogan goes. Thomas Jefferson, destined to be the nation’s first secretary of state and third president, surveyed much of Virginia and set an “exact description of the limits and boundaries” in 1781. But its borders were inexact out west. On a map Virginia stretched far across the Appalachians and onward to the Ohio and Mississippi rivers on the extremities of the land known to whites. On paper, the early commonwealth was one-third larger than the entire British motherland. 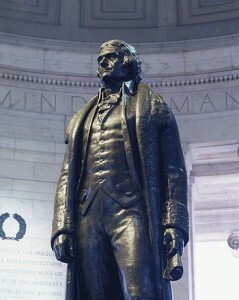 Jefferson’s name resounds to this day throughout ancestor-worshipping Virginia. 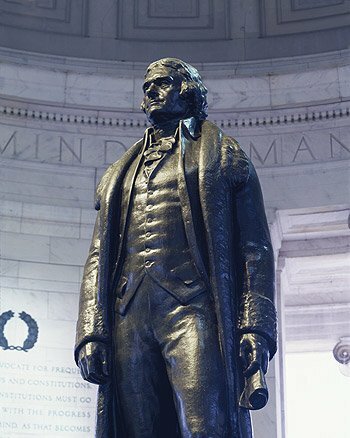 Veteran statehouse observers in its capital, Richmond, would be hard-pressed to recall the last important political speech that did not invoke Jefferson’s words. And the proclamations of other legendary Virginians — including the first U.S. president, George Washington; the 28th, Woodrow Wilson; and five other presidents born in Virginia — also have as much currency as they did generations ago. More than one Virginia visitor has gazed at a nearby thicket through the morning mist and imagined a Rebel column stirring as in Civil War times, or tarried on a great, white portico and thought of the inspiring oratory that sounded some of the first calls for American freedom. This shows Virginia in geographical context. Both West Virginia and Kentucky to the west were originally part of the commonwealth. (NationalAtlasl.com). But Virginia defies stereotyping as a stuffy time capsule. In this single state — shaped a bit like a wood plane whose high “knob” reaches up to Washington, flat bottom runs along the North Carolina border, and thin, pointed prow jabs far into Appalachia — one can leave the glistening strand of Virginia Beach for indolent swamps, cotton and tobacco fields, apple orchards, plantation homes, reborn colonial villages, wayside taverns, giant clothing and tobacco factories, an array of amazing caverns, the remnants of epic battlefields, and parallel mountain spines that stretch almost 650 km (400 miles) from Maryland to Tennessee. And there are plenty of Centreville-style suburban plats as well. No single metropolis dominates. Tourists enjoy the easygoing charms of Norfolk (deepwater ships), Roanoke (mountain music and art), Danville (old mills and warehouses), Lynchburg (abundant nearby battlefields), and Richmond, which for a time was also the capital city of the entire rebellious Confederacy. Still, it is the old, more than anything new, that makes Virginia unequalled in the land. This, after all, is the place that thought of itself as old even in the Civil War of the 1860s, when Confederate General George Pickett shouted to his troops, “Up, men, and to your posts! Don’t forget today that you are from Old Virginia” before leading the last, desperate charge up Cemetery Ridge at the Battle of Gettysburg in Pennsylvania. How old? Colonization began soon after the dawn of the 17th century, on May 13, 1607, when three vessels commissioned by the Virginia Company of London landed at Jamestown and began the first permanent settlement in the New World. An earlier colonization attempt at Roanoke Island, in what was then Virginia and is now North Carolina, was such a failure that no trace of it or its inhabitants has been found. 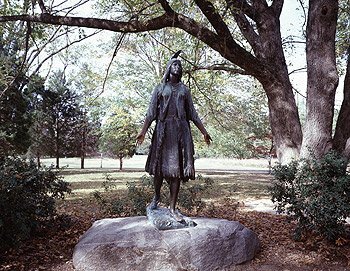 According to legend, Pocahontas, daughter of the Indian chief Powhatan, would save Captain John Smith from a violent death at Jamestown. Smith not only prospered; he even wrote a Historie of Virginia that became a prized book on the shelves of Virginia’s gentry. Think of it! Europeans had barely landed before they were writing histories of the place! 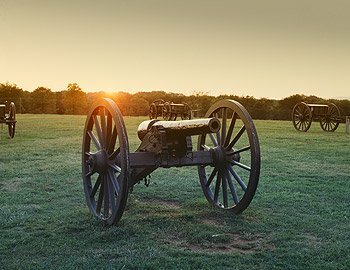 Virginia was for History Lovers even then. By 1618 the colony had achieved enough stability to convene a House of Burgesses, the first democratically elected legislative body in the New World. As settlement spread, three levels of Virginia society emerged: planters — chiefly of tobacco — who held most of the legislative seats; middle-class “yeomen”; and non-free laborers, including white indentured servants and ever-increasing numbers of black slaves. Virginians called the planters “cavaliers.” There aren’t many of them left, but the term remains the nickname of the sports teams at the state university in Charlottesville. Plantation farming spread westward to the “middle colony” around Williamsburg, and beyond to “frontier land” in the densely forested mountains. 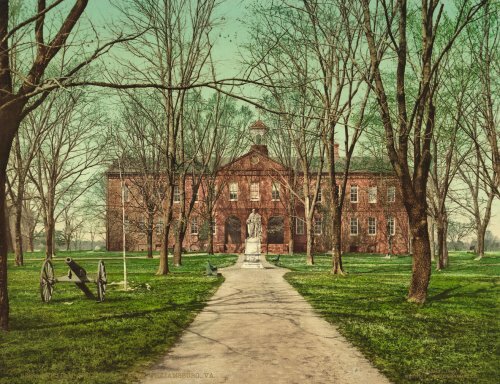 By 1693, Virginia Colony was prosperous enough to establish a college, William & Mary — named for England’s new monarchs — in Williamsburg, which would soon become the colonial capital. Tobacco dominated Virginia’s economy. By 1730, more than 9 million kilos (20 million pounds) of Virginia tobacco were shipped to England annually. Slaves, who had been 9 percent of Virginia’s inhabitants in 1700, would comprise 40 percent of a larger population 50 years later. Gentlemen may cry “Peace! Peace!” but there is no peace. The war is actually begun! . . . Is life so dear or peace so sweet as to be purchased at the price of chains and slavery? Forbid it, Almighty God! I know not what course others may take, but as for me, give me liberty, or give me death! After the revolution began in 1775, most of the fighting involving Virginians occurred in the West — today’s Midwest. But the climactic American victory took place on Virginia soil in 1781 at Yorktown, where the British, to the beat of an apt old tune, “The World Turned Upside Down,” marched in defeat to their ships and an ignominious sail home. Matters would turn complex for the new commonwealth — and nation — as slavery took root. Within a year of the Revolutionary War peace treaty, Virginia ceded the vast territory northwest of its mountains for future national expansion. In 1792, Kentucky — directly to the west, where slavery was only a here-and-there institution — broke away to become the nation’s 15th state. And when civil war visited Virginia 70 years later, its mountainous, non-slaveholding counties would leave, too, to form West Virginia. 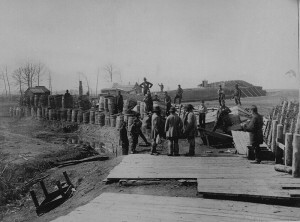 As the Confederate state nearest to Washington during the American Civil War, Virginia became the locus of bloody fighting, beginning with an embarrassing Union defeat at Manassas, continuing through fearsome campaigns in woodsy places such as “The “Wilderness,” and ending with rebel commander Robert E. Lee’s dignified surrender to Union general Ulysses S. Grant on April 9, 1865. Devastated by war, the Old Dominion’s cities grew slowly, and a majority of Virginians remained on upland farms and former plantations. Under President Jefferson, the United States almost doubled in size with the purchase from France, for $154 million, of the Louisiana Territory in 1803. Jefferson then dispatched two other Virginians, Meriwether Lewis and William Clark, to explore the vast Northwest. Two administrations later, President James Monroe, also a Virginian, enunciated principles that became the “Monroe Doctrine,” announcing U.S. “protection” of the entire Western Hemisphere from European colonization. 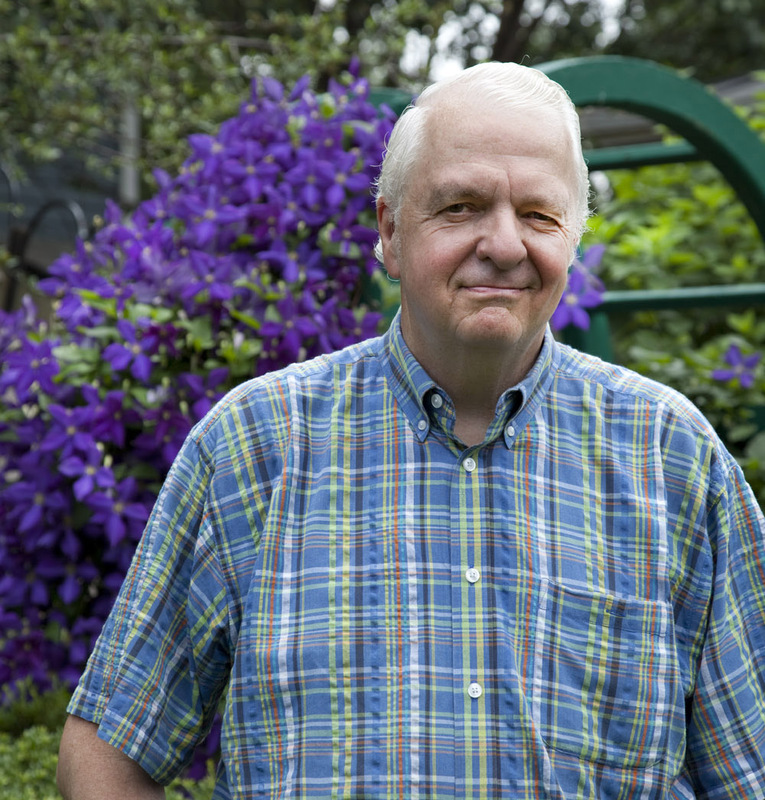 Virginians still speak proudly of “FFVs,” a term that everyone from Wachapreague on the Eastern Shore to Winchester at the northern end of the Shenandoah Valley understands. An FFV is a “First Family of Virginia,” a title loosely accorded to old-line families who trace their lineage to early English settlement. Many FFVs live in Old Town Alexandria, which surely sets it apart from the upstart suburbs. 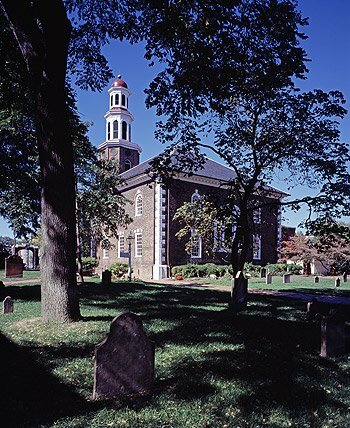 A staging area for British troops fighting the French in the 1750s and then that prosperous little port, Alexandria would be quickly taken out of action in the Civil War as Union troops poured out of Washington and over the Potomac River to occupy the town. It’s a good thing I’m not a Virginian, or I’d go on and on and on in this historical vein. If you were Virginians, you’d expect it! Minstrel. A folk singer, particular a comic singer in elaborate song-and-dance productions that traveled the Deep South before and after the U.S. Civil War of the 1860s. Some were whites in “blackface,” pretending to be uncultured African Americans. Retrocede. To give back. The term is often used in real estate, when a piece of property, having been given to an individual or community or state, proves not to be as useful as expected and is returned to the giver. Secede. To break away or withdraw from an organization or governmental alliance. The most famous secession in America occurred when ten southern states left the Union in the 1860s, triggering a great civil war. Yankee. The world has called Americans “Yankees” at least since World War One, when the song “Over There” proclaimed that “the Yanks are coming.” Northerners were “Yankees” during the U.S. Civil War in the 1860s. The term has been around longest as a unflattering name for folks living in the New England states of the American Northeast, who are sometimes portrayed as crafty but hard-hearted in business.